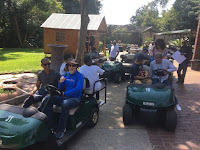 Team Building Pretoria Zoo in an Amazing Race has low physical requirements (Golf Cars), and is fit for all ages. Parking is inside the zoo, and there is a designated security guard. Survivor Team Building at the Pretoria Zoo are inclusive of entrance, venue hire, arrival coffee, refreshments, lunch, and all team building activities. Teams compete in an array of traditional games, as long as time permits. Popular games include Bharti (Foosball), Blind Folded Minefield, Magic Carpet, Hula Hoop Race, etc. Based on the Hollywood blockbuster with Tom Hanks, and Dan Brown's best-selling novel, that took place in Rome (low physical requirements). Teams have to solve four puzzles - earth, water, fire, and wind. Riddles include invisible ink and UV Torches. Chicken Quarters smoked for 4 hours in our Smoke Oven - Peri-Peri, BBQ, Tartar, and 1000 Islands. Served with black mushrooms topped with cheddar, baby potatoes, rolls, and 6 assorted salads. Quality plastic chrome cutlery and crockery for halaal. Soft drinks include 340ml soft drinks, i.e. Coke, Sprite, etc.